In a bubbly year for the biotech sector, these five stocks stand out over the rest. 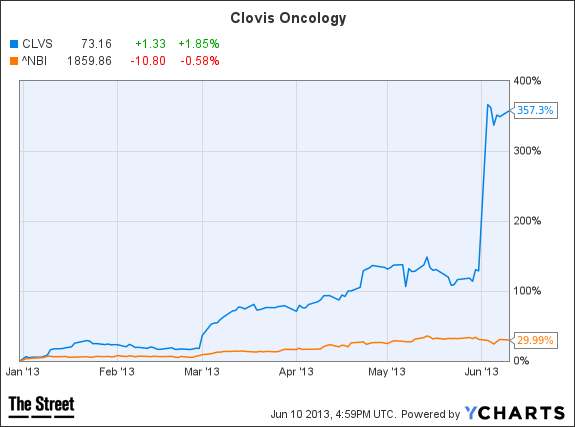 Clovis had "only" doubled in value through May 31 when the stock really took off following the presentation of data from a phase I study of its lung cancer drug CO-1686 at the American Society of Clinical Oncology (ASCO) annual meeting. When I say "data," I'm barely talking about the plural, given the small number of patients treated in the study. But tumor shrinkage reported with CO-1686 treatment was impressive, particularly in lung cancer patients with a specific mutation that made their tumors unresponsive to currently approved drugs. On Monday, Clovis announced plans to sell stock to raise as much as $170 million. On that news, Clovis shares went up! There's your biotech bull market in action. At some point, the Baker Brothers will own 145 percent of Acadia. I don't know how that's mathematically possible, but the fund will figure out a way. Once that happens, all the other hedge funds and retail investors who buy whatever stock Baker Brothers is buying will buy more Acadia. I'm joking, of course, but only a little bit. Baker Brothers, already the largest Acadia shareholder, disclosed an upsized 23 percent stake in the company last week. High-conviction stocks in the Baker Brothers portfolio -- think Seattle Genetics ( SGEN and Pharmacyclics ( PCYC -- tend to perform really well, sometimes regardless of near-term fundamentals. Oh yeah, it's worth noting that Acadia has a potential blockbuster drug in pimavanserin, which will be submitted to FDA as a new treatment for Parkinson's disease psychosis near the end of 2014. 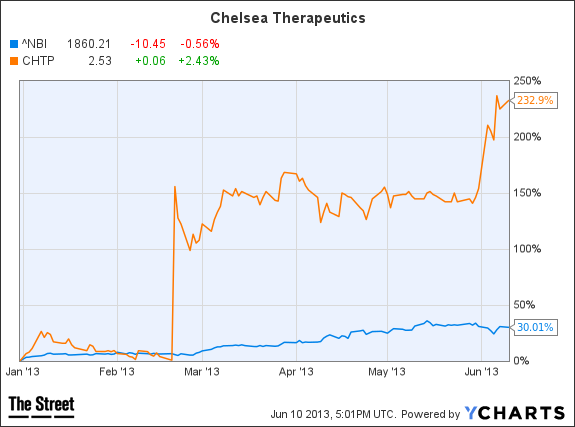 Chelsea shares started the year at well under $1, so it's spot among the best-performing biotech stocks is a bit misleading. Consider Chelsea's market is still only $170 million and that the stock price is down 50 percent from its level 18 months ago. But give Chelsea credit for perseverance. Despite a roller coaster development path, the company is poised to resubmit Northera to FDA later this summer as a treatment for neurogenic orthostatic hypotension. Cult stocks do well in frothy bull markets, which helps explain MannKind's inclusion on this list. The next round of pivotal clinical trials for the fast-acting inhaled insulin Afrezza are due in August, following two FDA rejections already. 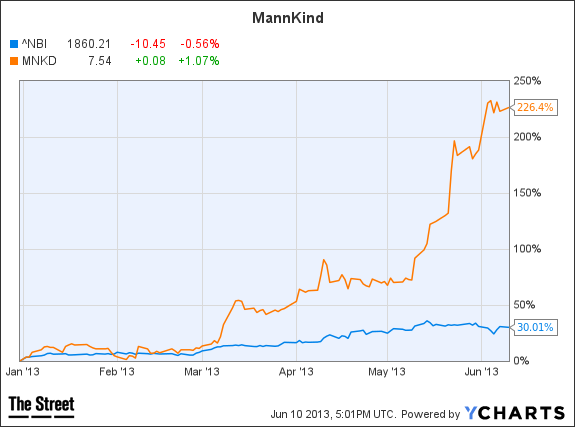 With MannKind shares clearly running up in anticipation of the data and the worshipping of company founder Al Mann reaching a zenith, anything less than a stellar performance from Afrezza could hit the stock hard. 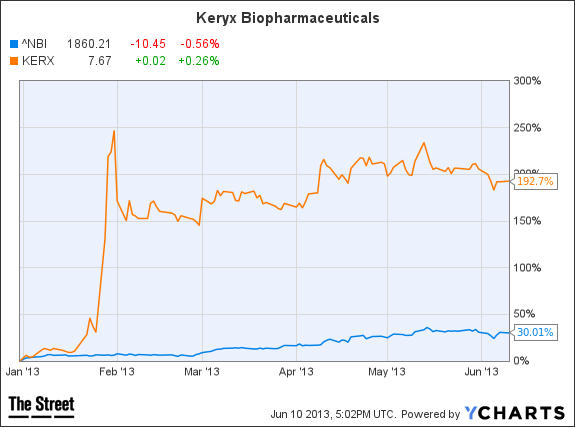 Keryx shares popped when the results from the Zerenex study in kidney dialysis patients were announced in January. Since then, the stock has traded mostly sideways on concerns about Keryx's ability to partner Zerenex and secure enough patent protection and market exclusivity to make the drug commercially viable. Will these five stocks maintain their performance through the remainder of 2013? It's impossible to predict, obviously, but it's interesting to note that Clovis, Acadia and MannKind weren't Top 5 stock performers for the year at the end of the first quarter. Three stocks that were on the list as of March 31 -- Hyperion Therapeutics ( HPTX, Oramed Pharmaceuticals ( ORMP and Coronado BioSciences ( CNDO -- have dropped off. Overall, 20 drug and biotech stocks have doubled in price this year. A factoid that may be interesting only to me: Celsion ( CLSN - Get Report) is the worst-performing drug stock year to date, but is "only" down 80%. Rounding out the bottom five: Oxygen Biotherapeutics ( OXBT, Aveo Pharmaceuticals ( AVEO, Genvec ( GNVC and Enzon Pharmaceuticals ( ENZN. 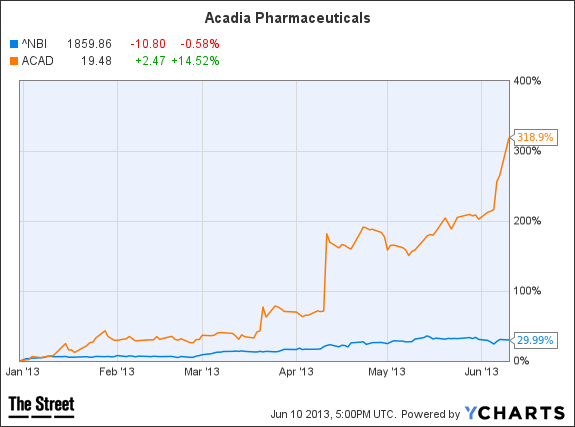 >>To see these stocks in action, visit the Five Best-Performing Biotech Stocks of 2013 portfolio on Stockpickr.